The True Love Cafe in Koringberg, in the heart of the Swartland wheatfields, is a celebration of what is simple and pure and true. It is a place of contrasts. Quiet calm in the refreshing Koringberg air, and loud laughter as old friends and new get together in the retro pub. Old masters on walls which are papered with newsprint. Ed Hardy tattoo designs and vintage portraits celebrating a mother's love. 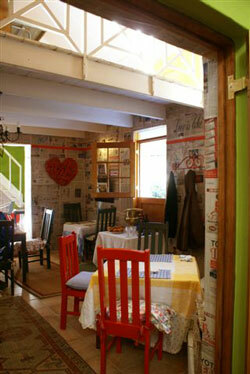 For Fiamma Forsdick, owner of the True Love Cafe, coming to this sleepy dorp has felt like coming home. After 27 very successful years in the restaurant and catering business, she was ready for something different. Fiamma's establishment is certainly adding to that atmosphere. The restaurant alone is worth the hour's drive from Cape Town. Fiamma, who was trained in Switzerland and was the owner of the cookery school, Yum, as well as seven previous restaurants, is serving deceptively simple, country food. “No towers or artistic drops of balsamic,” she declares. But the simplest cookery leaves the least room for error, and it is easy to recognise the touch of a master in her dishes. The menu changes regularly, depending on what is in season, so its worth asking what's on offer when you make your booking. Or just pop in, you'll be sure to be delighted by the experience. Opening hours are 09:00 until late, Wednesday to Sunday. To book, contact Fiamma Forsdick at 072 572 0586 or 022 423 8386. 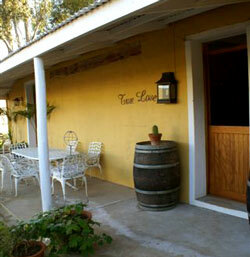 True Love Cafe is 0.4km from the centre of Koringberg , the nearest airport 105.8km (Cape Town International Airport).